Crimean–Congo hemorrhagic fever is a tick borne zoonotic infection caused by the arbo-virus, which is a member of the genus Nairovirus (family Bunyaviridae) and is characterized by a sudden onset of high fever, chills, severe headache, dizziness, malaise, abdominal and back pains also in some cases diarrhea, nausea, vomiting, muscle aches, sore throat and thrombocytopenia. In severe cases, hemorrhagic expressions, grading from petechiae to huge areas of ecchymosis, may also raise. Crimean Congo hemorrhagic fever (CCHF) is a challenge for the people of endemic rural regions, and for veterinary and health care personnel, and shows a significant mortality. The disease is broadly distributed in Africa, Asia and Europe, and has become a serious threat to public health. Several genera of ixodid ticks contribute both as reservoir and vector for CCHFV; on the other hand, Hyalomma genus of ticks are mainly essential to the bionomics of this virus. Thus, contact to these ticks acts a main threat for catching disease; though, additional main risk factors are identified and are discoursed in this article. In modern era, main progresses in the molecular recognition of CCHF-virus, mainly the usage of real-time PCR, in clinics and fields for tick samples have been allowed for quick diagnosis of infection and molecular epidemiological research. CCHF have limited treatment choices. During sporadic outbreaks of disease Ribavirin and Immuno-therapy have been attempted with unreliable degrees of achievement, however restricted epidemiological field trials has been carried. Therefore, currently no anti-viral treatment approved by the U.S Food and Drug Administration for the treatment of CCHF. But, changed concerned in CCHFV, besides better understanding of its fundamental biology, might possibly contribute to enhanced therapies in the coming future. This review article mainly discussed about the introduction, etiology, epidemiology, history, clinical characteristics, pathogenesis, diagnosis, treatment of CCHF and its potential risk for bioterrorism and a threat to public health. Crimean–Congo hemorrhagic fever is one of the major important ticks-borne infection causes by virus, inducing intermittent occurrence of serious disease in a vast geographical region. The is maintain in horizontal and vertical spread cycles needing ixodid types ticks in a range of domestic and wild animals, with no indication of disease signs. Congo virus mobilizes in numeral genera of ticks, however Hyalomma spp. are the main cause of human being illness, possibly as equally adult as well as immature types vigorously try to find hosts, to obtained blood meals from that hosts necessary for its all phase of growth. Commonly this disease occurs amongst farming personnel succeeding the bite off of contaminated tick, and also to a smaller degree amongst butchers naked to the tissues or blood of infected farm animals and health employees when exposed to the patient’s body fluids . CCHF for the first time was detected in 1940’s, eminent degrees of genomic variety dispute against a modern origin . The transmission of the virus is through the bite of a contaminated tick or by direct contact with infected patients or the products of affected animals (livestock) (Figure 1) . It has been discovered in at least thirty-one ticks species of the soft ticks (Argasidae) also hard ticks (Ixodidae). The ticks have sexual transovarial virus transmission i.e., transmission from infected mother to egg phase, and transstadial spread means, transmission from larval stage to nymph and from nymph stage to adult one . 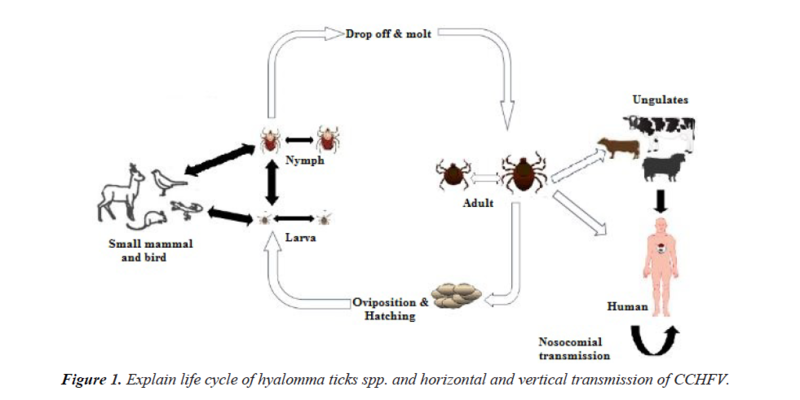 Figure 1: Explain life cycle of hyalomma ticks spp. and horizontal and vertical transmission of CCHFV. Human beings become affected by CCHFV contaminated ticks bites, which retain a lifetime illness and is capable to be reservoirs, or through contact with viral contaminated blood or tissues. In adding to zoo-notic spread, this virus is able to circulate from individual to individual and consider one of the infrequent hemorrhagic fever viruses capable to start nosocomial occurrences in health care centers through elevated standard of sanitation and cleanness . Humans are the single famous hosts of the virus of CCHF, in which illness is evidenced as a severe febrile sickness accompanied by a lethal hemorrhagic syndrome having up to 50% mortality rates . Agricultural workers, shepherds, campers, veterinarians, slaughter houses human resources, and people in contact with farm animals and ticks are consider to be at greater threat of infectivity . In animals, the disease is generally subclinical and goes from a few days to weeks. CCHF has been accounted in roughly thirty (30) countries and has one of the mainly wide geographic dispersions of all major tick borne viral illnesses, closely similar to the known worldwide distribution of Hyalomma ticks specie . Outbreaks of this disease usually occur when the Hyalomma ticks. Spp are on their highest point of activity. However Hyalomma ticks are thought to be the most vital role in the epidemiology and distribution of CCHF . Crimean-Congo hemorrhagic fever has been documented in about thirty (30) countries and has one of the most wide geographical distributions of all main tick-borne viral illnesses, closely similar to the known worldwide distribution of Hyalomma ticks specie . Outbreaks generally occur on the peak activity time period of Hyalomma spp. ticks. Though Hyalomma spp. ticks are considered main significant in the epidemiology of CCHF, this virus was also separated from ticks of other genera (Boophilus, Rhipicephalus, Haemaphysalis, Dermacentor, and Ixodes spp.) which may possibly lead to its extensive ecological distribution . Now the disease occurs periodically throughout much of Asia, Africa, and Europe with outcome of approximately 30% death rate. Similar to other tickborne zoonotic pathogens, Crimean-Congo hemorrhagic fever virus usually circulates in environment unobserved in endemic tick –vertebrate - tick cycle. Blood serum obtained from numerous wild animals species having antibodies to CCHFV and sero-epidemiological reports have also found antibodies to CCHF-virus in domesticated sheep, goats, donkeys, horses, pigs, and cattle from different regions of Africa, Asia, and Europe . From 2000-2008, the disease emerged or in other words re-emerged in Albania, Bulgaria, Kosovo, and Turkey. It has also come out in Greece, in the recent past, where the primary human case has been recognized. The disease has been recognized to modest wintertime’s and also linkages with the interference of farming, equally to enhanced tick population, besides to the movement or transfer of tick-infested animals and birds. Likewise to Senegal, South Africa, and Kenya, the epidemics of 2002 in Anatolia, an eastern Black Sea, and Northeastern total geographical constituency, take long time of serologically demonstration of a zoo-notic focal point, not documented in men throughout the state. a large number of CCHF confirmed cases occurred in western and southeastern regions of Turkey in 2007 to 2008, which added 9% of victims in 2008. The spread of this disease has extended to Turkey formerly non-enzootic regions, close to Aegean beach of the state and in a backward region of Ankara . Human being may influence the biology of CCHFV and thus change the risk for transmission. Disruption of agricultural activities alters in land use from flood plain to farming land, abandonment of hare hunting accompanied by introduction of farm animals, and war conflicts have been linked with great CCHF outbreaks in the former Bulgaria, Soviet Union, Turkey and Kosovo . In Pakistan the first CCHF case was documented in 1976 from a patient who undergone laparotomy at Rawalpindi General Hospital. Fourteen epidemics, plus eight by means of hospital born, documented in the nation state, mostly in the Northwestern and Western regions since 1976-2003. In 1978 the primary periodic victim was recognized in Baluchistan territory of Pakistan, where documented cases take place every year, reporting from 1987 to 2001. According to NIH- Islamabad (National Institute of Health), greater part of confirmed IgM cases of CCHF detected from 2003–2008, fifty seven (57) confirmed cases from Baluchistan, followed by twenty cases from Khyber Pakhtunkhwa, six from Punjab and two (2) from Sindh province of Pakistan. According to World Health Organization, in September six (6), November-2013, four (4) deaths (two CCHF) documented from Abbottabad area of Khyber Pakhtunkhwa, all four (4) reported victims belonging to similar family unit of Abbottabad, Pakistan, and they were slaughter house workers by occupation; whereas four (4) additional CCHF cases, two (2) confirmed from district Killa Abdullah; and two suspected cases recorded in 2013 from districts Musa Khail and Loralai in Baluchistan province. So for a total of seventy two (72) suspected, forty eight (48) confirmed cases of CCHF and sixteen deaths documented in the state throughout 2013. About sixty two assumed cases were identified during the year 2012, with forty one confirmed and eighteen (18) deaths; in which thirteen (13) deaths were recorded of the laboratory identified cases and five deaths were recorded as assumed CCHF. About twenty three (23) clear-cut cases were reported from Baluchistan, seven (7) from Sindh; six (6) from Khyber Pakhtunkhwa and five (5) from Punjab province of Pakistan. Round about all reported cases has record with tick bite, contact with patient, butcher/animals slaughtering, animal trading/ handling, animal skin handling, and tannery employee. There is movement of livestock’s and skins of livestock’s involving nearby countries particularly Iran, Afghanistan and intra Pakistan (Table 1). Table 1. CCHF suspected cases documented in Pakistan, during the year 2000 to 2016. Several ixodid ticks genera’s provide both as reservoir and vector role for Congo virus; though, ticks belongs to the genus Hyalomma are principally important in the epidemiology and ecology of CCHF and the CCHF-virus. Hence, contact to this type ticks acts as a main factor of risk for catching infection. It has been recognized to the interruption of farming activities and to mild winters, both reporting for an enhanced tick population, in addition to the transportation or migration of tick- invaded animals or birds. CCHF virus is mainly isolated from two species of ticks in the family Argasidae (soft ticks) and from seven genera of the family Ixodidae (hard ticks). Although ticks belonging to the Hyalomma spp. are are play an important role in the epidemiology of Congo hemorrhagic virus, but the virus has been isolated from other ticks genera like Dermacentor, Ixodes, and Rhipicephalus spp as well, which play an important role in its extensive ecological circulation. The genetic character of ticks is excessively essential, not solitary as viral vectors, but also acts as a reservoirs host for the etiological agent (virus) in nature. Confirmation of this observable fact for CCHFV is based mostly on restricted viral isolations from the eggs of fieldcollected Hyalomma ticks spp. And Dermacentor ticks spp. and isolation of virus in the spring from unfed ticks . Following a short developmental phase, the characteristics of the disease is; abrupt start of elevated fever, harsh head pain, chills, dizziness, abdominal and back trouble. Other signs include vomiting, nausea, and diarrhea, neuropsychiatric and cardiovascular alterations . Clinical symptoms of infection commonly include fever, hemorrhages and myalgia. Levels of liver (hepatic) enzymes are raised, and bleeding markers are frequently increased . The incubation time of disease starts from days to week; the duration mostly depends of on the transmission route of the disease as well as the quantity of inoculums. The pre-hemorrhagic period typically starts with headache, dizziness, vomiting fever, and myalgia and end after three days. The disease is shorter hemorrhagic fever stage and characteristics GIT-system blood loss, respiratory plus urinary tract furthermore blood loss from skin ranging from petechiae to ecchymosis. Additional signs comprise distended liver as well as spleen which round about 30% of patient’s knowledge. The mortality rate can be reached up to seventy percent, but average is 30% . Pathogenesis of CCHF is characterized poorly due to various causes such as; sporadically occurrence of diseases, insufficient facilities for autopsies, virus handling need BSL-4, bio-safety level 4 containment labs, lack of available animals model of infection. Information about pathogenesis of CCHF is inadequate, but generally derived from liver biopsies and patient’s blood analysis, by means of equipment during outbreaks in Turkey . The main complete study relating fifty (50) patients of CCHF from South Africa was attempted. In the details of the research, the study explain that hemorrhage in cerebral regions, rigorous dehydration, shock, and anemia linked with lung edema, pleural effusion, and lengthened diarrhea are the elements inducing lethal result. Approximately majority deaths cases were due various organ failures (Figure 2). Figure 2: Crimean–Congo hemorrhagic fever virus infected patient develop a striking pattern of large ecchymoses which are not seen in other types of viral hemorrhagic fever. Early diagnosis of CCHF is necessary, both for the outcome of the patient and, because of the probability for nosocomial infections, to prevent further disease transmission. Patient history and Clinical symptoms, particularly history of tick bite or exposure to tissues or blood of animals or human patients and travel to endemic regions, are the first indicators of CCHF. Serologic tests for the diagnosis of CCHF virus before 1980, such as hemagglutination inhibition, immune diffusion and complement fixation, suffered from a lack of sensitivity and reproducibility . In recent times, latest immunological assays containing recombinant CCHFV nucleoprotein have been originated and applied in an immuno-fluorescence assay  or to identify serum antibodies from infected patients in an ELISA [18,19]. Currently the frontline diagnostic tools used for the confirmation of CCHFV is RT-PCR which is a Molecular diagnostic assays, and present a valuable complement to serological diagnosis . A further progress on the conventional RT-PCR test has been the improvement of automatic real-time assays. Numerous investigators have documented that the use of real-time PCR for discovering various viral etiology of hemorrhagic fevers , including Rift Valley fever [22,23], Ebola [24-26], and dengue viruses [27,28]. To culture and isolate virus BSL-4, bio-containment labs are required. However conventional technique to isolate CCHFV has been undertaken via intra peritoneal or intra-cranial inoculation of a sample (e.g. blood sample from a patient in acute- stage) into newborn infant mice. Isolation in cell culture is future less complicated and gives a more rapid outcome or result, but is normally thought to be less sensitive method . Depending on the strain and cell line, the virus possibly will develop no or little cytopathic effect also into a non-cytopathic infectivity of the cells, though; virus can be recognized through IFA (immuno-fluorescence assay) by particular antibodies i.e., monoclonal . There are limited options for the treatment of CCHF. Ribavirin and Immunotherapy are attempted having changing levels of achievement during sporadic outcomes of disease, but there is no evidence of conducting case-controlled trials. As a result, there is presently no antiviral treatment for CCHF accepted by the U.S. Food and Drug Administration (FDA). While, renewed interested in CCHFV fundamental biology may lead towards improvement in therapies . The main risk factor for CCHF is the spread of contaminated Hyalomma ticks species in the population and peoples from the endemic region are at greater risk. Particularly individuals working outdoor with large number of domestic animals, personnel working in hospitals and caring CCHF infected patients, individuals crushing infected ticks and butchering infected animals have also been a frequent source of CCHFV infection . Incidence of nosocomial infection occurred in Pakistan, during January 1976 in the CGH (Central Government Hospital). A person by occupation shepherd was admitted having distinctive indications of disease and pass away at that time. The patient’s father, who looks after his son at home, was admitted in the hospital and died two days later even with repeated blood transfusions and intensive care. A female medical officer, who admitted the disease affected patient, when the doctor was contaminated by patient vomited blood, showed signs of CCHF and was also admitted in the same hospital, but luckily recovered. The surgeon died of CCHF two weeks later, while operating to cut the finger of the patient in the hospital. A junior medical doctor (surgeon) also infected by CCHF virus while cutting his finger at the time of operation and admitted to the hospital; he then recovered later. An attendant nurse helping during an operation also passes away due to CCHF, after three days. The anesthesia specialist also infected and bleeding starts from his gums, but fortunately recovered. Five other people also infected through CCHFV in the hospital, they were hospitalized and all the five individuals were recovered. Out Of 12, ten staff members of the hospital became infected, while attending the shepherd in the hospital; out of ten, 2 passed away and 8 after rigorous sickness get recovery. In tygerberg hospital of South Africa another nosocomial outbreak takes place. In which 33% of hospital staff were infected by CCHFV through unplanned prick of needle and about 8.7% were infected by the disease through contacts with blood of the patient (Figure 3) . Figure 3: Factors for emergence of Crimean–Congo hemorrhagic fever (CCHF). How to prevent and control CCHF? The most excellent way to prevent infection is to reduce or avoid contact to the etiological agent (virus). This can only be achieved by various techniques. Individuals who are at highest risk of disease are veterinarians, sheep herders, butchers, etc. must have to get all preventative measure to keep away from contact to virus contaminated ticks or viral-infected blood of animals e.g., wearing of gloves and minimizing contact to exposed body surface, tissues as well as blood of animals are successful trials to control the practically. Similarly, healthcare workers also must have to adopt standard preventive measure protocol and techniques, while attending supposed CCHF infected persons. Acaricidal treatment of domestic animals in CCHFV prevalent regions is successful to minimize the of contaminated ticks population. In the Soviet Union formalin inactivated mouse-brain vaccine of CCHF was originated and accepted for use in 1970 . The extremely pathogenic characteristic of the Crimean–Congo hemorrhagic fever virus has contributed to the terror that it may be utilized as an instrument of bio warfare and bioterrorism and has resulted in its inclusion as a NIAID and CDC Category C Priority infectious agent. CCHF virus can be communicated from one individual to another individual, having a prominent case fatality rate, and may be transmittable through aerosol; however, the unfitness of this virus to duplicate in higher densities in cell culture is quoted as a main obstacle to the expansion of the virus as a mass target weapon as discoursed  and therefore precludes its categorization as A or B Category infectious agent. This extremely fatal character of the pathogen has limited investigation to BSL-4 research labs and accordingly had restricted research investigations. Crimean-Congo hemorrhagic fever (CCHF) is a threat to public health. Cases of CCHF occurring as an expected consequence in endemic regions should be notified to practitioners in the global neighborhood. Therefore community should be attentive about the chance of importation of CCHF cases from enzootic (endemic) areas, of man-to-man transmission, mainly in the nosocomial situation, and of the probable transmission of the pathogen (virus) via tick-infested and contaminated imported livestock/farm animals. The report of geographic distribution of CCHF (Tables 2 and 3) is a challenge for the scientific community of epidemiologists, medical microbiologists, medical entomologists, and veterinarians that could be adopted by acceleration of a European Standardized Response (ESR) at the regional, national and international level . Table 2. Summary of published information’s of CCHF in central & eastern Asia, with total cases and case fatality rates were obtained from the articles cited. Table 3. Published information’s of CCHF in Middle East and Turkey, with total cases and case fatality rates were obtained from the articles cited. Explaining the potential impact of CCHF on public health, this review summarizes the recent perceptive of CCHFV to demonstrate a broad basis for the evaluation of threat to public health and the development of prevention strategies. In respect to the extensive distribution of CCHFV, the wide host diversity of its vectors, the excellent adjustment of the virus to the vector population collectively with its potential to be transmissible from individual to individual (e.g. by nosocomial transmissions), the inadequate therapeutic interventions, and the high lethality rate make CCHFV a major public health threat. By summarizing distinct features of CCHFV related to public health, this review highlights the motivation for further research studies and points out gaps in existing knowledge. It emphasizes the importance to make stronger public health preparedness in general, and to refine or establish satisfactory diagnostic tools for systematic veterinary, human, pathogen and vector surveillance, particularly in regions where CCHF is predictable to arise in the future. In order to prevent the introduction of CCHFV into new regions and to protect the community, this review provides strategy for classifying the risk/threat of every country and region as a foundation for managing the risk presented by CCHF virus. These guiding principles for the management levels and classification can also be adjusted and used for other tick-borne infections. As the awareness of CCHFV as a severe threat to public health has originated, the primary large-scale approaches in regard to risk estimation, surveillance and diagnostics research studies have been in progress. Further international interactions about this vital public health problem are definitely required in future [36-51]. Bente DA, Forester NL, Watts DM, et al. Crimean-Congo hemorrhagic fever: history, epidemiology, pathogenesis, clinical syndrome and genetic diversity. Antiviral Res. 2013;100(1):159-89. Carroll SA, Bird BH, Rollin PE, et al. Ancient common ancestry of Crimean-Congo hemorrhagic fever virus. Mol Phylogenet Evol. 2010;55(3):1103-10. Mehravaran A, Moradi M, Telmadarraiy Z, et al. Molecular detection of Crimean-Congo haemorrhagic fever (CCHF) virus in ticks from southeastern Iran. Ticks Tick Borne Dis. 2013;4(1-2):35-8. Tahmasebi F, Ghiasi S, Mostafavi E, et al. Molecular epidemiology of crimean-congo hemorrhagic fever virus genome isolated of ticks from Hamadan province of Iran. J Vector Borne Dis. 2010;47(4):211-6. Dorleans F, Giambi C, Dematte L, et al. The current state of introduction of human papillomavirus vaccination into national immunisation schedules in Europe: first results of the VENICE2 2010 survey. Euro Surveill. 2010;15(47). Shepherd A, Swanepoel R, Leman P, et al. Field and laboratory investigation of Crimean-Congo haemorrhagic fever virus (Nairovirus, family Bunyaviridae) infection in birds. Trans R Soc Trop Med Hyg. 1987;81(6):1004-7. Zakhashvili K, Tsertsvadze N, Chikviladze T, et al. Crimean-Congo hemorrhagic fever in man, Republic of Georgia, 2009. Emerg Infect Dis. 2010;16(8):1326-8. Ergonul O. Crimean-Congo haemorrhagic fever. Lancet Infect Dis. 2006;6(4):203-14. Watts DM, Ussery MA, Nash D, et al. Inhibition of Crimean-Congo hemorrhagic fever viral infectivity yields in vitro by ribavirin. Am J Trop Med Hyg. 1989;41(5):581-5. Nabeth P, Thior M, Faye O, et al. Human crimean-congo hemorrhagic fever, senegal. Emerg Infect Dis. 2004;10:1881–1882. Estrada-Pena A, Zatansever Z, Gargili A, et al. Modelling the spatial distribution of Crimean Congo hemorrhagic fever outbreaks in Turkey. Vector Borne Zoonotic Dis. 2007;7:667-78. Pak T. Ecology of Crimean hemorrhagic fever in Tadzhikistan. 1974. Weber F, Mirazimi A. Interferon and cytokine responses to Crimean Congo hemorrhagic fever virus; an emerging and neglected viral zonoosis. Cytokine Growth Factor Rev. 2008;19:395-404. Swanepoel R, Gill D, Shepherd A, et al. The clinical pathology of Crimean-Congo hemorrhagic fever. Rev Infect Dis. 1989;11:S794-800. Akinci E, Yilmaz M, Bodur H, et al. Analysis of lymphocyte subgroups in Crimean-Congo hemorrhagic fever. Int J Infect Dis. 2009;13:560-3. Hoogstraal H. The epidemiology of tick-borne Crimean–Congo hemorrhagic fever in Asia, Europe, and Africa. J Med Entomol. 1979;15:307-417. Saijo M, Qing T, Niikura M, et al. Immunofluorescence technique using HeLa cells expressing recombinant nucleoprotein for detection of immunoglobulin G antibodies to Crimean–Congo hemorrhagic fever virus. J Clin Microbiol. 2002;40:372-5. Saijo M, Qing T, Niikura M, et al. Recombinant nucleoprotein-based enzyme-linked immunosorbent assay for detection of immunoglobin G antibodies to Crimean–Congo hemorrhagic fever virus. J Clin Microbiol. 2002;40:1587-91. Tang Q, Saijo M, Zhang Y, et al. A patient with Crimean–Congo hemorrhagic fever serologically diagnosed by recombinant nucleoprotein-based antibody detection systems. Clin Diagn Lab Immunol. 2003;10:489–491. Drosten C, Kummerer BM, Schmitz H, et al. Molecular diagnostics of viral hemorrhagic fevers. Antiviral Res. 2003;57:61-87. Drosten C, Gottig S, Schilling S, et al. Rapid detection and quantification of RNA of Ebola and Marburg viruses, Lassa virus, Crimean–Congo hemorrhagic fever virus, Rift Valley fever virus, dengue virus, and yellow fever virus by real-time reverse transcription-PCR. J Clin Microbiol. 2002;40:2323-30. Garcia S, Crance JM, Billecocq A, et al. Quantitative real-time detection of Rift Valley fever virus and its application to evaluation of antiviral compounds. J Clin Microbiol. 2001;39:4456-61. Gibb TR, Norwood DA, Woollen N, et al. Development and evaluation of a fluorogenic 5_ nuclease assay to detect and differentiate between Ebola virus subtypes Zaire and Sudan. J Clin Microbiol. 2001;39:4125-30. Towner JS, Rollin PE, Bausch DG, et al. Rapid diagnosis of Ebola hemorrhagic fever by reverse transcription-PCR in an outbreak setting and assessment of patient viral load as a predictor of outcome. J Virol. 2004;78:4330-41. Weidmann M, Muhlberger E, Hufert FT. Rapid detection protocol for filoviruses. J Clin Virol. 2004;30:94-9. Callahan JD, Wu SJ, Dion-Schultz A, et al. Development and evaluation of serotype- and group-specific fluorogenic reverse transcriptase PCR (TaqMan) assays for dengue virus. J Clin Microbiol. 2001;39:4119-24. Houng HH, Hritz D, Kanesa-Thasan N. Quantitative detection of dengue 2 virus using fluorogenic RT-PCR based on 3/-noncoding sequence. J Virol Methods. 2000;86:1-11. Swanepoel R. Crimean-Congo hemorrhagic fever. Handbook of zoonoses, section B: viral zoonoses. 2nd edn. CRC Press Inc., Boca Raton, Florida. 1994:149-161. Whitehouse CA. Crimean–Congo hemorrhagic fever. Antiviral Res. 2004;64:145-60. Papa A, Chaligiannis I, Xanthopoulou K, et al. Ticks parasitizing humans in Greece. Vector Borne Zoonotic Dis. 2011;11:539-42. Van De Wal B, Joubert J, et al. A nosocomial outbreak of Crimean-Congo haemorrhagic fever at Tygerberg Hospital. Part IV. S Afr Med J. 1985;68:729-32. Tkachenko EA, Butenko AM, Butenko SA, et al. Prophylactic characteristics of a protective Crimean hemorrhagic fever vaccine. In: Chumakov MP (ed. ), Crimean Hemorrhagic Fever – Materials of the 3rd Scientific-Practical Conference in Rostov-na-Donu Region. USSR, Moscow. 1970:136–8. Borio L, Inglesby T, Peters C, et al. Hemorrhagic fever viruses as biological weapons. JAMA. 2002;287(18):2391-405. Vorou R. Crimean-Congo hemorrhagic fever in southeastern Europe. Int J Infect Dis. 2009;13:659-62. Papa A, Ma B, Kouidou S, et al. Genetic characterization of the M RNA segment of Crimean Congo hemorrhagic fever virus strains, China. Emerg Infect Dis. 2002;8(1):50–53. Yashina L, Petrova I, Seregin S, et al. Genetic variability of Crimean–Congo haemorrhagic fever virus in Russia and Central Asia. J Gen Virol. 2003;84:1199-206. Seregin SV, Samokhvalov EI, Petrova ID, et al. Genetic characterisation of the mRNA segment of crimean- Congo hemorrhagic fever virus strains isolated in Russia and Tajikistan. Virus Genes. 2004;28(2):187-93. Ergonul O. Crimean–Congo hemorrhagic fever (Presentation). Second FAO/OIE/WHO Joint Scientific Consultation on Influenza and other Emerging Zoonotic Diseases at the Human–Animal Interface. 2010;27–29. Burney MI, Ghafoor A, Saleen M, et al. Nosocomical outbreak of viral hemorrhagic fever caused by crimean hemorrhagic fever- Congo virus in Pakistan 1976. Am J Trop Med Hyg. 1980;29(5):941-7. Smego Jr RA, Sarwari AR, Siddiqui AR. Crimean–Congo hemorrhagic fever: prevention and control limitations in a resource-poor country. Clin Infect Dis. 2004;38(12):1731-5. Yadav PD, Cherian SS, Zawar D, et al. Genetic characterisation and molecular clock analyses of the Crimean-Congo haemorrhagic fever virus from human and ticks in India, 2010–2011. Infect Genet Evol. 2013;14:223-31. Suleiman MN, Muscat-Baron JM, Harries JR, et al. Congo/Crimean haemorrhagic fever in Dubai. An outbreak at the Rashid Hospital. Lancet. 1980;2(8201):939-41. Al-Tikriti SK, Al-Ani F, Jurji FJ, et al. Congo/Crimean haemorrhagic fever in Iraq. Bull World Health Organ. 1981;59(1):85–90. Tantawi HH, Al-Moslih MI, Al-Janabi NY, et al. Crimean-Congo haemorrhagic fever virus in Iraq: isolation, identification and electron microscopy. Acta Virol. 1980;24(6):464-7. El-Azazy OM, Scrimgeour EM. Crimean-Congo haemorrhagic fever virus infection in the western province of Saudi Arabia. Trans R Soc Trop Med Hyg. 1997;91(3):275-8. Scrimgeour EM. Crimean–Congo haemorrhagic fever in Oman. Lancet. 1996;347:692. Saluzzo JF, Aubry P, McCormick J, et al. Haemorrhagic fever caused by Crimean Congo haemorrhagic fever virus in Mauritania. Trans R Soc Trop Med Hyg. 1985;79(2):268. Chinikar S, Ghiasi SM, Hewson R, et al. Crimean–Congo hemorrhagic fever in Iran and neighboring countries. J Clin Virol. 2010;47(2):110-4. Maltezou HC, Maltezos E, Papa A. Contact tracing and serosurvey among healthcare workers exposed to Crimean–Congo haemorrhagic fever in Greece. Scand J Infect Dis. 2009;41:877-80. Mustafa ML, Ayazi E, Mohareb E, et al. Crimean–Congo hemorrhagic fever, Afghanistan, 2009. Emerg Infect Dis. 2009;17:1940–41. Atkinson B, Chamberlain J, Logue CH, et al. Development of a real-time RT-PCR assay for the detection of Crimean–Congo hemorrhagic fever virus. Vector Borne Zoonotic Dis. 2012;12(9):786-93.